Amy Denio attended Brookside School and Kingswood School Cranbrook in Bloomfield Hills, Michigan from kindergarten through 12th grade, graduating in 1979. She became an autodidactic musician at age 12, quitting piano and starting guitar. She attended Colorado College, and also Hampshire College, graduating with a B.A. in Music Composition and Improvisation from Hampshire in 1984. She is self-taught on guitar, electric bass, drums, saxophone, clarinet, accordion, and various world instruments. She was sponsored by Jazz India to live in Bombay and study Thumri, Northern Indian vocal technique from Dhanashree Pandit-Rai in 1997. Since 1988, she has performed at festivals in India, Japan, Hong Kong, Taiwan, Brazil, Argentina, North America, and throughout East and Western Europe. From 1985–1990, Denio was Programming Office Coordinator at the Seattle headquarters of Yesco Foreground Music, which later merged with Muzak. In 2007 she was commissioned by the Dream Community in Taipei, Taiwan to arrange, record and produce Taiwanese aboriginal and popular music with sambarhythms from Brazil. These arrangements were performed by junior high school students at the Camphor Tree School, who are from the Amis tribe of Taiwan. 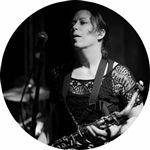 She has taught workshops on composition, improvisation, and extended vocal techniques throughout the US and Europe. She produced two albums for the Mediterranean band OU and collaborates with them live.